​​In November, 2016, ABCD's Project Manager, Firas Sarhan, with Physiotherapists Lesley Gillon and Alice Inman facilitated a two week training course for the medical staff of Jalazone and Nour Shames refugee camps. Twelve people from each camp partook of the course and found it hugely beneficial. ​Lesley is an Independent Physiotherapist and Manual Handling Practitioner MSc. PG Cert (HE) MCSP HPCP reg. She is also Chair of ADAPT (Chartered Physiotherapists in International Health and Development). ADAPT is a professional network of physiotherapists in International Health and Development. ​Due to the success of the course, ABCD hopes to run similar courses in 2017. ​In 2015, ABCD in conjunction with the University of South Wales set up a Music Therapy placement at the Bethlehem Arab Society for Rehabilitation. This proved a wholly successful project. ABCD has repated the placement this year to great success but sadly, without the University of South Wales. 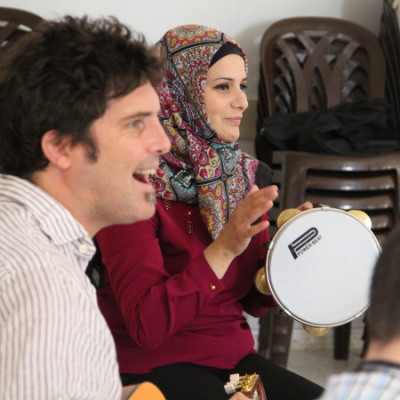 ​Nick Wilsdon, a music therapy student, spent 8 weeks in August and September with the BASR in Beit Jala setting up music therapy groups both at the centre and at outreach programmes. Supported in his clinical work by our Music Therapy Trustee, Canon Claire Tillotson and with the help and support of all of the staff at BASR, Nick has managed to complete a successful and mutially beneficial placement which ABCD hopes to repeat in the years ahead.